This last point is where a lot of people (and organizations) get confused. Obviously the goal of a company blog is to drive traffic to your website, to build your brand and to engage your audience. But that doesn’t mean that every blog should be an ad. In general, people don’t like ads. They won’t read a blog filled with shameless self-promotion. However, they will read a blog that contains interesting information, facts and viewpoints, even if it comes from a company. This is the line that you will want to walk when you are coming up with ideas for a company blog. Here are some tips that can help you. 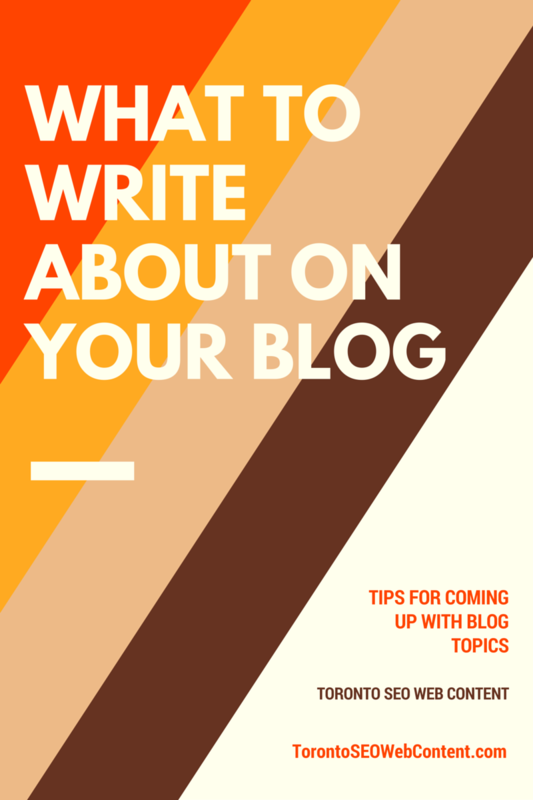 Stuck coming up an interesting topic for your next blog post? Keep the following points in mind. It’s not about you. As mentioned, visitors don’t want to read ads. However, they do want to read blog posts that answer questions and discuss topics that matter to them. Think about some common questions that you’re often asked by customers. Then come up with ways to turn these questions into blog posts. This method is successful for a number of reasons. One, it provides current customers with information they need. Two, it shows your expertise in your field. Three, it drives traffic to your website. Potential customers who are looking for information will find your blog post and that will draw them to your company. Just because you’re not writing an ad, it doesn’t mean that you can’t have business goals in mind when you’re writing. In fact, it’s important that you do. For example, consider the difference between writing a company blog post on “What our staff did for our company party” versus “Why you should choose [x product] over [y product].” While the first type of post might be okay to write occasionally, the second type clearly has a stronger business focus and is also more interesting for potential customers. A lot of people have the tendency to write in complex, flowery sentences when they sit down to write something “serious.” While this is helpful sometimes, it’s often a better idea to write in a more simple, straightforward manner. Posts written this way are easier and more enjoyable to read. However, that doesn’t mean that you have to be boring. You can still be humourous, interesting and intelligent without writing a university-level lecture. Some businesses are afraid to share information or experiences on their company blog because they’re worried about competitors “stealing” these details. However, visitors enjoy posts that contain detailed information and they like the feeling of “learning something new” about an industry. Plus, these posts show your readers that you know what you’re talking about, which builds confidence in your brand. Blogging Blogging, business, company website, internet promotion, Web Copywriting Tips, Website Promotion, Writing for the web. permalink.